Zomorod (Cindy) Yousefzadeh is the new kid on the block . . . for the fourth time. California’s Newport Beach is her family’s latest perch, and she’s determined to shuck her brainy loner persona and start afresh with a new Brady Bunch name—Cindy. It’s the late 1970s, and fitting in becomes more difficult as Iran makes U.S. headlines with protests, revolution, and finally the taking of American hostages. Even puka shell necklaces, pool parties, and flying fish can't distract Cindy from the anti-Iran sentiments that creep way too close to home. A poignant yet lighthearted middle grade debut from the author of the best-selling Funny in Farsi. "Filled with humorous touches and authentic cultural references, Dumas’s story will resonate not just with young immigrants but with any readers trying to adapt to new situations." * "Dumas’ semi-autobiographical novel is both funny and affecting...Readers will be thoroughly invested in Cindy’s story, whether holding their breath or laughing out loud, and always hoping that the Yousefzadehs will come out on top." * "[A] fresh take on the immigrant experience—authentic, funny, and moving from beginning to end." 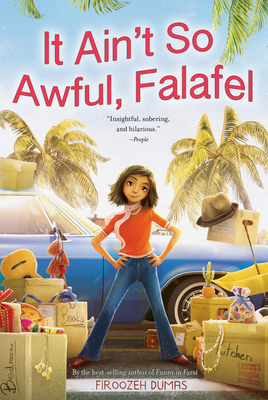 "[It Ain't So Awful, Falafel] is funny, affecting, and nuanced...The novel doesn’t sugarcoat the issues, but it balances these serious notes with preteen antics and melodramas that Blume would be proud of; Cindy’s voice will undoubtedly draw in readers from all backgrounds." "...keeps readers engaged with the very real and relatable difficulties of finding friends after moving, dealing with family issues both domestic and abroad, and discovering one’s own identity in middle school."